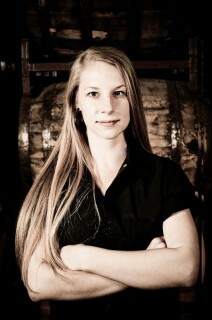 ALAMEDA, Calif., April 29, 2014 /PRNewswire/ — Hangar 1 Vodka, a pioneering American craft distillery, today announces Caley Shoemaker as its new head distiller to lead every phase of operations. Shoemaker comes to Hangar 1 Vodka from Stranahan’s Colorado Whiskey in Denver, where she immersed herself in the mechanics and science of distillation. In addition to mastering every piece of equipment in the production process, Shoemaker learned how the chemistry of distilling affects the quality, texture and flavor of the final product. She also led distillery tours and interacted extensively with the public. This multidisciplinary, hands-on education and experience have prepared Shoemaker to effectively take the reins at Hangar 1 Vodka. Hangar 1 Vodka also announces its move to a new 32,500-square-foot micro-distillery at Building 22 at the Alameda Naval Air Station in Alameda, Calif. The new facility at 2505 Monarch Street is located near the company’s original home, Hangar 1, which is a former airplane hangar that lent the spirit its name. Crowned with a new 500-gallon still, it demonstrates the brand’s commitment to continuing to handcraft locally produced, top quality vodka in Northern California. The new facility will be functional in Summer 2014 and a tasting room for visitors will open in Summer 2015. Hangar 1 Vodka’s decision to create its new micro-distillery nearby underscores its dedication to Alameda and the Bay Area, which has been the cradle of the brand’s success and an inseparable part of its DNA. Its naming of Shoemaker represents something of an industry breakthrough, since she is one of a handful of female distillers of her generation to lead operations at a major American spirits brand. Based in Alameda, Calif., Hangar 1 Vodka is a pioneering American craft distillery. Since launching in an airplane hangar in 2002, its handcrafted, top quality vodkas have earned fans throughout Northern California and beyond, both for its standard-setting straight expression, as well as flavored versions that include Mandarin Blossom, Buddha’s Hand Citron and Kaffir Lime. The flavors are completely natural and derive from freshly harvested, farmer-sourced fruit. They are made using traditional techniques found in European eau de vie production. For more information, please visit http://hangarone.com, “like” us on Facebook at https://www.facebook.com/hangaronevodka and follow us on Twitter at @hangaronevodka. Hangar 1 Vodka is owned by Proximo, a spirits importer. Proximo is a privately owned, premium spirits importer founded in 2007 and based in Jersey City, New Jersey. The company’s portfolio includes: Stranahan’s® Colorado Whiskey, TINCUP® American Whiskey, Hangar 1® Vodka, Boodles® Gin, 1800®Tequila, Jose Cuervo® Tequila, Three Olives® Vodka, and The Kraken® Black Spiced Rum. For more information about Proximo, please visit www.ProximoSpirits.com.